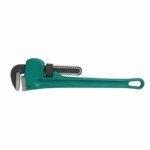 A pipe wrench is a handy tool to rotate or fix pipes and other components. The main distinctive feature is its ability to clench the component. 10" heavy-duty pipe wrench with a strong, one-piece cast iron body. 12" heavy-duty pipe wrench with a strong, one-piece cast iron body.